Starting in September, 2003, the Jeffers Petroglyphs began hosting monthly homeschool days. The monthly events were started by a volunteer at the Petroglyphs who is also a homeschooling mother, after seeing the great programs that school groups took part in during field trips. Each homeschool day has different themes, projects and activities. Some have a general course of study that everything relates to that day, such as the atlatl or geology. Other days have a mix of all different subjects. Some of the activities offered during the first year were learning to flintknap, ID'ing actual arrowheads, doing a hands-on archeological activity with artifacts found at the site, making atlatls to take home, making a prairie plant replica, learning about the travois, making & decorating felt parfleches, seeing atlatls from around the world and making cordage from native plants. There were also coloring pages, activity sheets and hand-outs for the families to take home, all related to the day's themes. Several homeschool families have made the trip on several different months, with some coming from as far as 5 hours away to take part. The current schedule for 2006-7 can be seen here. Events may change, though. Call ahead to make sure. The website put up by the homeschoolers has information about the days and pictures from previous events. 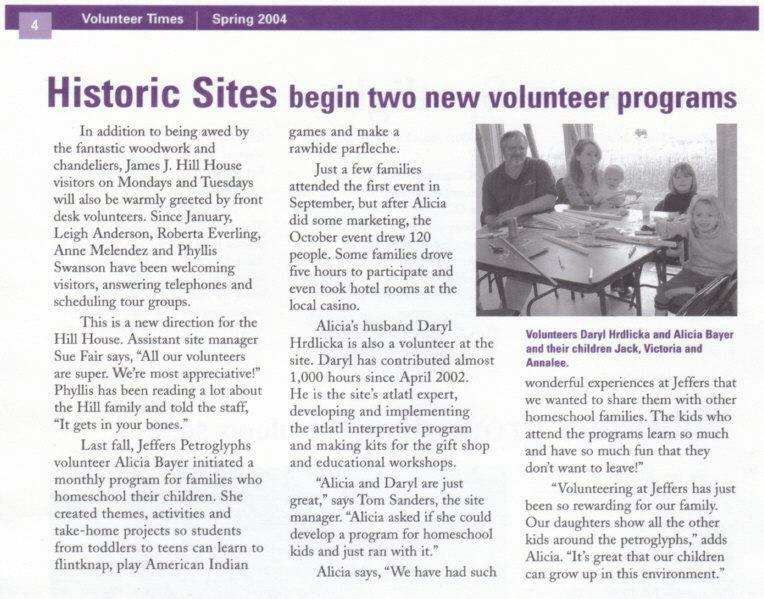 The homeschool days were also featured in the Minnesota Historical Society's Spring Volunteer Newsletter.